This program is Freeware, and it may be distributed to anyone. It can only be installed using the "Setup(WMPplaylist).exe" file, as only this setup file contains all necessary support files. 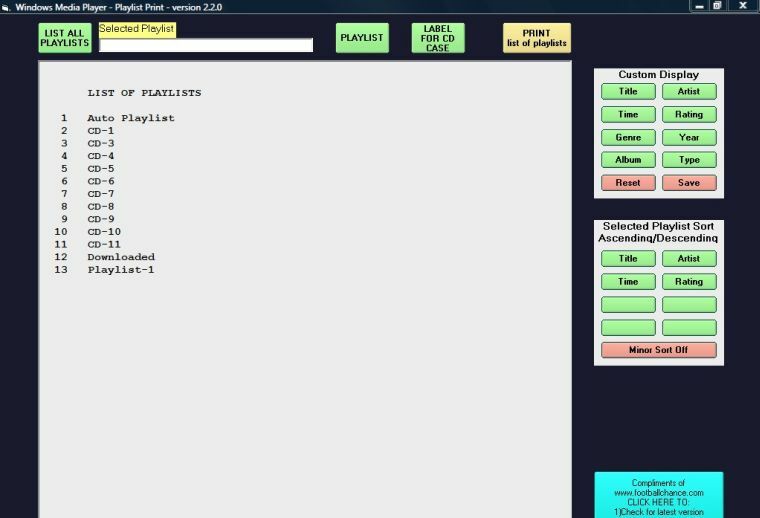 The program will only print your playlists and/or make a compact playlist label for your CD case. It provides no playlist management. All permanent editing or sorting of playlists are done with Windows Media Player, or the Player you are using. The software requires that Windows Media Player be installed on your computer, and that you have already added your music files to the Player’s media collection, even if your music files are run from a different Player. If you haven’t added your music files to the Windows Media Player’s media, in the Player, click File (in WMP 11 right-click on top or bottom bar), and then select one of the options listed under Add to Library. Note that this doesn’t move your files to a new location on the hard drive and it doesn’t somehow configure them so they can be played only with Windows Media Player. It just makes the Player aware of the files existence. WMP Playlist has been checked on Windows Media Players 9, 10, 11, and 12. When a playlist is renamed, a long delay may occur (30 sec) before the Playlist Print program recognizes the renamed playlist. 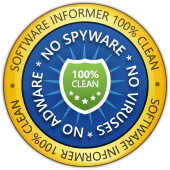 This software contains no adware, spyware, or other malicious content. No technical support is available for this program. Suggestions and constructive criticism are always welcome. Use the sales link at the bottom of this page. Minimum screen resolution is 800x600 (or larger) File size is about 1.2 MB. Once the software file (Setup(WMPplaylist).exe) has been downloaded, double click on the file to execute it. The setup program will guide you through the necessary steps. A convenient place to temporarily store the download is on your desktop. There is no need to save the setup file since it can be downloaded again, if necessary. So after installing WMP Playlist, right-click on Setup(WMPplaylist).exe and select "Delete" to remove the downloaded executable file from your Desktop. If a previous version of WMP Playlist is on your computer, there is no need to uninstall the old version before installing the latest version. Version 2.2.0 Added custom display, using six items, in "Label for CD case". Two labels can now hold 128 song titles. Version 2.2.1 10/29/2007 Fixed form and displayed output to work properly under various monitor screen resolutions. Version 2.3.0 4/4/2012 Fixed runtime '13' error that occurs when song files are moved, playlist no longer points to the correct location, and the length (time) of the song shows up as zero. Version 2.3.1 1/30/2014 Windows Common Controls Mscomctl.ocx will be loaded and registered if it does not exist on your computer.